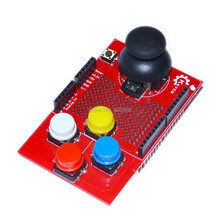 In this code example we will take a look at the PS2 JOYSTICK SHIELD V2.0. 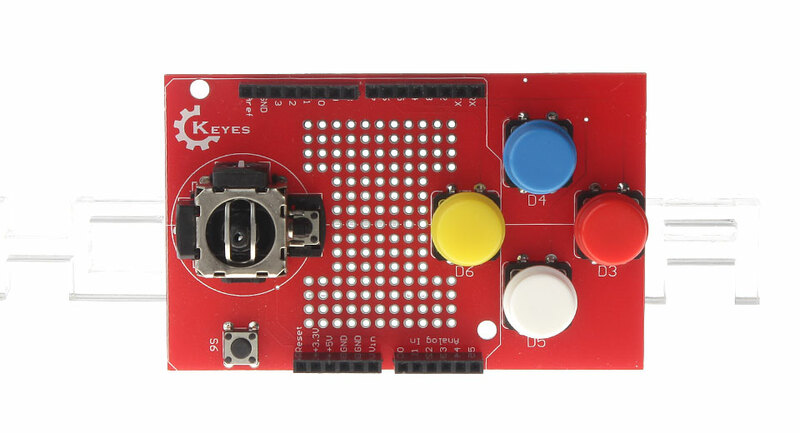 The X-axis of the joystick is connected to pin A0 of Arduino, the Y-axis to pin A1, power supply to 5V and ground to GND. There are four buttons on the PS2 JOYSTICK SHIELD . D3 should be connected to digital pin 3; D4 to digital pin4; D5 to digital pin 5; D6 to digital pin 6. The other small button is reset button. Generally, PS2 rocker can be used for controlling small vehicles. It is mainly comprised of two 10K potentiometers and a button switch. The five ports are VCC, X, Button, Y and GND. //Read the value of the buttons and print it on the serial port.